I had a feeling that my long run today was not going to go well. And I was right. I woke up late, at 7:00 (I probably should have gotten up at 5:00 to be out the door at 5:30 to beat the heat). I didn't leave the house until 7:30 ish, and then got to the community center to park my car at 7:50. Too late on a hot day to start a 14-mile run. It was extremely sticky and humid, and I was totally dreading the whole run. I had mapped out a route--it was a kind of T shape, starting at the bottom of the T. I started running, and I kind of wished I had brought my iPod for some sort of distraction--I could feel it would be a looong run. 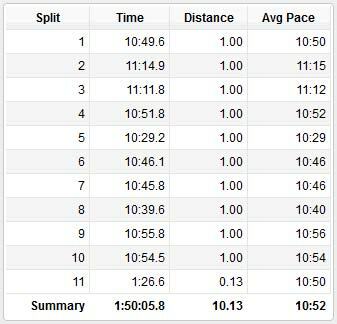 I ran at what felt like my normal pace (my long run pace is usually a 10:15/mi pace). After a mile, I saw that I was running a 10:50 pace. I know that it was because of all the crappy eating and alcohol-drinking I did on vacation! I tried to pick up the pace a little, and after another mile, I was going even slower, at an 11:15 pace. I was really starting to worry about even finishing the run. Each step was tough, and the sun was just beating down on me. I was drenched in sweat just three miles into the run. I was very tempted to call it quits at mile 5, when I could choose to keep going (the "right arm" of the T) or I could turn right and head back to the car. I kept telling myself, "Keep running... make it to mile eight, and then if you STILL feel like crap, you can call your dad to pick you up and take you to your car." My dad works at the Metropark that I run through, and I always carry my cell phone. I've never actually gotten picked up from a run before (although I came close once), but it was nice to keep that as a back-up plan in my mind. It was SO HARD to keep going... each mile felt like forever. I finished off my Gatorade and stopped at a water fountain at mile eight to refill my bottle. I doused myself with water, hoping to cool off and feel better. I started running again, and just felt terrible. I decided to call my dad at mile nine. I stopped running, and stopped my Garmin. I dialed my dad, and it rang twice, then went to voice mail. I tried two more times, and realized he wasn't going to answer. I was pretty upset at this point, and tried my mom. No answer. Called Jerry's cell. No answer. I turned around at mile nine (where I was supposed to turn anyway) and kept running, starting to feel really upset. At mile 10, I tried our land line, and Jerry answered. I started crying, and told him that I couldn't make it, and I was four miles from the car. He tried calling the park office to get a hold of my dad, and there was no answer (why don't people answer their phones?!) so he said he'd come get me. I ran a little ways ahead and saw a park ranger's truck, so I waved him down. I asked him if Les was working, and could he get a message to him. He offered to drive me to where my dad was probably working, so I went; but my dad wasn't there. So he tried calling my dad on the phone, and he couldn't get any service on his cell. Then he offered to drive me to my car himself--I was SO grateful. So I ended up hitching a ride with him the rest of the four miles to my Jeep. I was SO relieved to see it! I was thinking I'd finish out the four miles on the treadmill when I got home, but I changed my mind. I looked at my training schedule, and next week is a 13-miler, so I will just do 14 instead, and go on with the schedule as planned. I was just about to get in the shower when I remembered that I had to do my Wii Active 30-Day Challenge. I was so tempted to skip it, but I'm more than halfway done. There were tons of lunges today, and surprisingly, I don't hate them nearly as much as I used to! They've gotten so much easier over the past couple of weeks since I started the challenge. The exercise on there that I currently hate the most is the squat and hold... you have to hold a squat for 60 seconds! That may not sound hard (it didn't sound hard to me, because I actually don't mind squats), but it is KILLER, and I still haven't been able to hold the whole 60 seconds without a break. I stuck to my plan as far as meals go today. Dinner was amazing! I bought some tofu to try recently--I've tried it a few times in the past and didn't like it, but I'm always willing to try things over and over again until I (hopefully) like it. So I did some searching online and combined a few different methods/recipes for cooking it--I was especially inspired when I saw this. I drained and pressed the (extra-firm) tofu. To do this, I just set the block of tofu on a flat strainer, then lay a paper towel and heavy pan on top of it for a few hours--it presses the liquid out. Then I sliced the tofu into triangles, dusted them with a touch of cornstarch, and laid them out on a baking sheet sprayed with cooking spray. I baked them at 400 degrees for about 25 minutes. Meanwhile, I stir-fried a bunch of veggies--mushrooms, cabbage, bean sprouts, green beans, broccoli, yellow squash, zucchini, and carrots. And I made a sauce from this recipe (2 Tbsp. soy sauce, 2 Tbsp. rice vinegar, 1 Tbsp. honey, 1 Tbsp. chili sauce, 1/2 Tbsp. ginger, 2 cloves garlic, and 1 tsp. sesame oil). When the veggies were done cooking, I poured the sauce into the pan and let it cook for a couple of minutes. To serve, I layered brown rice, then the tofu, and then the veggies and sauce on top. It was SO GOOD. Extremely spicy, from the chili sauce--about as spicy as I can stand--but I loved it, and so did Jerry. I was really surprised at how much I liked the tofu. It wasn't mushy at all (that's what I hated about it before). I'm definitely going to be buying it again. I was most shocked that Jerry really liked it. I love that Jerry is adventurous and will try anything I make. Some of you asked what he thinks about vegetarian eating--he's still eating meat, just usually with his lunches (he'll take meat sandwiches to work). He really loves lentils and beans, so I make a lot of dishes with the beans and lentils for dinner. My family has eaten vegetarian dishes like that for dinner probably 3-4 times per week for a long time, so we're all used to it. Now, I still cook vegetarian most of the time, but if they want something with meat, I'll cook it for them and then I'll have something else I want for dinner (oatmeal, cereal, eggs, etc). Or I'll cook a vegetarian dish and then make some meat "on the side" for the family--which is something I did a lot even before I quit eating meat, because I just don't like meat very much. I still hesitate to call myself "vegetarian", because I don't know if this is going to be a permanent or temporary thing. I'm just trying it out indefinitely to see how it fits into my life. So far, it's been super easy for me. Jerry's first race is tomorrow morning--a 10K! He says he's not nervous, but I don't know if I believe that or not ;) I'm excited for him, and the kids and I are going to go cheer him on. He said he doesn't have a time goal, that he just wants to finish, which I think is great! Good luck to Jerry! Can't wait to hear how it goes. Sorry to hear about your long run today. I love that you came back and made a plan to make it up next week. I just want to say I Love your blog. I went for a one mile walk/run today and I just signed up for my first 5k run..Thank you for sharing you journey!!! Katie, someone told me about a way to prepare tofu that is a lot easier than having to press it, etc, and it comes out chewy! If you get a tub of extra firm tofu, freeze it over night, then defrost it. You can then just squeeze it out, then slice and saute or bake...it's easy to do it this way and it comes out firm and chewy! I do this all the time. I'm so glad you were finally able to get a ride back to your jeep. As I was reading about your run, it pulled on my heart so much. I know what it's like to feel like you felt and believe me it's not fun. I'm not a runner nor a walker but I remember at one time my husband made me walk for 6 miles. I was almost to the car when my body just gave up and gave out. I almost collapsed right there in the middle of the closed road. Every ounce of me wanted to lay down on that hot asphalt and die. My husband had to literately push me up the hill to the car. I can't tell you how much relief I felt when I laid eyes on the car. It didn't help me move any faster but it did assure me that I wasn't going to die on the closed road. I have yet to attempt that walk since. I'm super scared of it. You encourage so many people and I hope to be one of them (I hope your determination finally sinks into my thick skull). Good luck to Jerry tomorrow! That dinner looks delicious! I really enjoyed hearing about your long run but I'm sorry it was so miserable! Earlier this week I set out for a 12 mile run and I felt pretty good besides it being hot. I felt like I was putting effort in but not TOO much. Well, I was running slower than ever! I was so angry I quit. I know real mature right? ;) I haven't had a long run since, so I'm gonna have to get back out there and make up for it. I don't know why that happens. I felt good and fast! Oh well. There's always next time! My half marathon is 30 days away! Thanks for the peek into your family's eating style.I appreciate you answering my question. I meal plan in a very similar pattern. My family does eat beans, lentils and tofu, but they would much rather eat meat. We compromise about once a week with seafood, which I still eat. They usually choose meat of we eat out too. Good luck to your husband on his 10k and here's to a positive long run for you next week. I remember watching Oprah and Bob Greene kept telling her she was going to regret all of the wine she had been drinking with dinner. She dismissed him and then was crying the next morning during their run. I bet it feels the same as running after donating blood! Once you've had a week or your regular routine under your belt I'm sure you'll be back to normal. Where was your dad? Also I'm new so I'm looking for friends. Just love your recipes..blogs. They are first things I read every mornings. I SO feel you on the not answering the phone ! Over 80% of the time, my husabnd doesn't answer his. He claims " it didn't ring, I left it on my desk, it was on vibrate- I didn't feel it ..... " REALLY !? Will try the recipe ..... looks YUMMY ! Your run sounded just like mine did!!! I started out at 8am and by that time it was already to humid that my run was terrible. We managed 7 miles but I did walk a few of the hills. It was way too hot, humid and hilly!!! !